Wyatt Technology offers a complete compliance program including documentation and on-site validation for all of its instruments as well as all necessary resources and tools. Validation takes place in the form of IQ (Installation Qualification) and OQ (Operational Qualification). IQ tests that all the different parts of the instrument perform according to specification (e.g., the photodiodes, the laser, etc.). OQ tests that the instrument as a unit performs to specification. Many users find that they can readily perform IQ/OQ in a day, after having completed Light Scattering University training in Santa Barbara. Alternatively, we are happy to arrange for a Wyatt Applications Scientist or technician to come on-site and run a complete IQ/OQ validation. We do not offer documentation for PQ (Performance Qualification), which tests the SEC/GPC system as a whole (pump, columns injector, detectors, etc. ); this is application and method specific and so needs unique documentation for each application or customer. For customers working in an environment regulated by the FDA, it is necessary that software be compliant with regulations adopted by the FDA. These regulations are contained in the Code of Federal Regulations (CFR), Title 21, Part 11, and are entitled “Electronic Records; Electronic Signatures”. The rules change significantly how computer-generated data is to be stored and used, and aim to make electronic records comparable to a lab notebook in terms of providing a traceable record that is immutable. 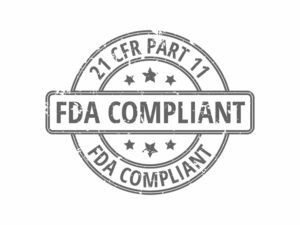 In order to comply with the strict demands of 21 CFR Part 11, Wyatt Technology Corporation has designed its main software product, ASTRA, from the ground up to comply. In addition, the ASTRA software has been developed under a formal quality system to ensure that the software is completely ‘validatable’. Wyatt Technology Corporation welcomes audits by qualified personnel to verify that we have met the requirements of 21 CFR Part 11.